Good morning, my DIY friends! Cutting Edge Stencils loves a great makeover story especially when it involves using stencils to add personality and pattern. It’s a no brainer for us since stencils are so easy to use and they are completely customizable. 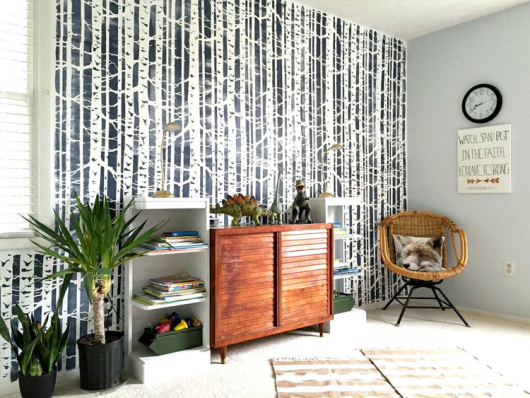 We are excited to share a fun makeover story using one of our most popular nature-inspired patterns, the Birch Forest Allover Stencil. We’d like to welcome back Chelsea, the creative decorator behind the blog Style Mutt Home. She’s been a busy stenciling bee and we can’t wait to share her new project and fun stencil giveaway. Chelsea has two little boys who share a bedroom. 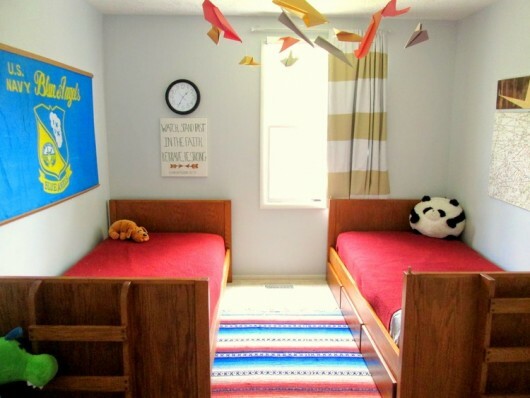 They were sleeping in separate beds that Chelsea decided to turn into bunk beds so she could open up the room a bit to provide more play space. 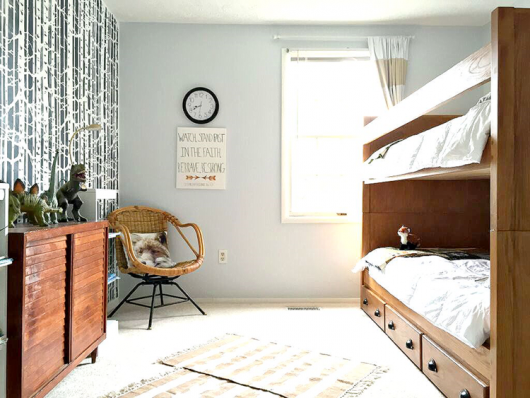 She commented, “My hope for this room was that it be a fun, open space where our imaginative wild things could let loose and be themselves.” Here is what the room looked like before the beds were bunked. After the beds were bunked on the right hand side, it opened up the area on the left. Chelsea decided to create a feature wall on the left hand side. 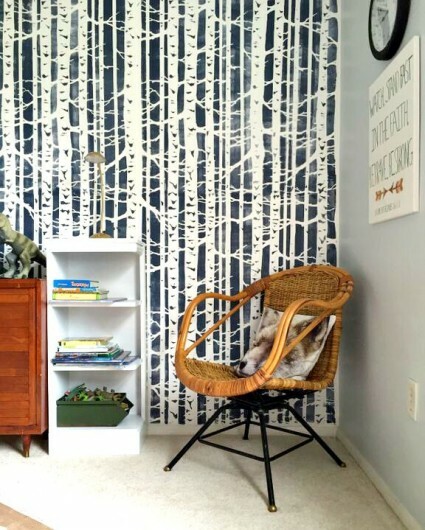 Since their house backs up to a wooded area that her boys love to explore she thought the Birch Forest Stencil would be the perfect pattern to bring the carefree outdoors inside. Chelsea used blue painter’s tape to hold the stencil in place and a dense foam roller to the paint the pattern in navy. After painting one section, she would un-tape the stencil and reposition it to stencil a new section. She did this until the pattern was complete on the accent wall. Once the whole wall was stenciled, Chelsea added a couple of cute decor items. And here it is folks! Chelsea found a mid-century modern cabinet at a garage sale for $30 and reused the bookshelves they had. She commented, “This stencil is really the only major thing going on in the room! ” Chelsea kept her accents to a minimum using rustic wood tones and white to complete the space. And here is a close-up of her stenciled wall. 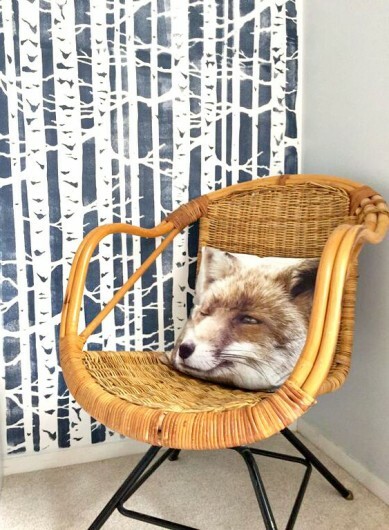 We think the rich woodsy pattern looks perfect with the rustic wicker decor. Want to win a free stencil? Enter to win a free stencil from Cutting Edge Stencils on Chelsea’s blog, Style Mutt Home! 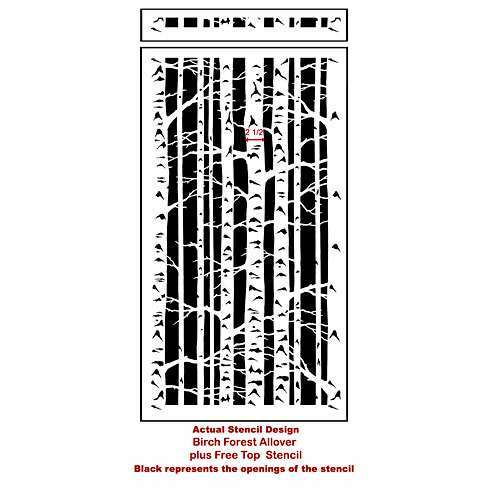 Tell us, where would you stencil the Birch Forest Allover pattern? Leave us a comment below, we’d love to read your thoughts! 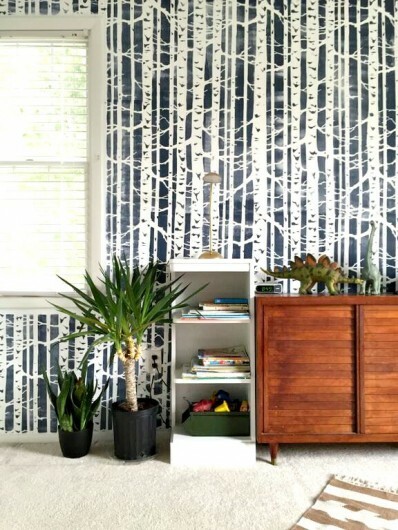 Get Stenciling and DIY Decorating Ideas through Pinterest!